The gig is up. The truth is out there. I read you like a Dr. Seuss book. However you want to say it. I have seen the light, and I will not perpetuate the urban myths. Here it is; Washington State is a big, beautiful, sunny place in the summer, and a big beautiful ski area on steroids in the winter. I first went out there a few years ago. My cousin continued to tell me it’s often overcast and cloudy; filled with rain. Each day I was there, it turned out more sunny, and more beautiful than the day before. He kept telling me; “Zulu, seriously, it’s not always like this.” Finally, I couldn’t take it anymore, and I told him what I really thought (me being so shy to begin with).”I’m on to you. You’re just passing along the un-truths to keep the tourists away! “To make matters worse, not only was each day sunny around the Seattle area, but with low humidity, mild temperatures, and a geographical longitude at the other end of the time zone, summer lasted well into the night. In some ways, the great weather seemed to un-nerve him. With each new day, came a greater level of climate change deniability; not to be confused with those denying climate change (don’t get me started). One day I retrieved a voice mail message from my phone. It was my cousin leaving a message in a over-giddy basically “I told you so” voice. “Did you see that? Rain, rain, rain; pouring down “like a big dog!” I felt bad calling him back with the voice my father used when he told me that “no, I didn’t see your brother hit you first, so stop causing trouble!” I had to break the news to him. The day before I grabbed my rental bike, jumped the ferry from Seattle to Victoria, British Columbia, and rode all day in the sunshine; sorry, I missed the rain. If you don’t believe I was there, you can check with the customs agents in “spooky room #7” where I was later detained for being a U.S citizen “sneaking” back in to the U.S using my Irish Passport without a Visa ( a story for another day). After a brief stay, I left the Pacific Northwest. Last week I returned in the winter for my ski safari, with my ski buddy, and truth in tow. As the Who once sang; “We won’t get fooled again.” As we drove out to Mt Baker one day, we saw a sign that said “Mosquito Lake Next Right.” Initially, there was great pause from my friend until he let out “what the hell was that, and who the hell would go there?” I blinked for a brief moment; impervious to the “Jedi mind trick.” I explained the whole Eric The Red, Viking trick; naming the nice place Iceland, and the not-so-nice place Greenland, I told him how the locals wanted to scare away the tourist. “See, It’s probably a beautiful place with a deep crystal blue lake sleeping in the foothills of the Cascades. The sign was just enough to shed the un-welcome but not enough to grab the attention of say…….the CDC; Center for Disease Control. After all, a sign that said Malaria River might be a bit over the top! My buddy John, now in the know, was soon tested again. We approached a small “town.” Out of the depths of Route 5-1- something or other” popped a rotary. Having been through rotaries all over the world including the Magic Rotary near Swindon, in England, where 5 mini rotaries revolve around a larger main 6th rotary, I was well versed what they looked like, and how to transverse them. What happen next was unexpected. We entered the rotary at the “6 o’clock” position, and drove counter-clockwise. We exited at the “12 o’clock” position. So far, so good. 40 yards out of the rotary, the thought hit both John and I at the same time. Doubting for a moment our powers of observation, each agreed that we just saw signs at the 3, and 9 o’clock positions that said “Dead End.” What did that make this place? A “rotary to nowhere”, public fund abuse project, or just a plain over-engineered curve in the road? Suddenly, the picture came into my head; you know the one from television, and the movies. 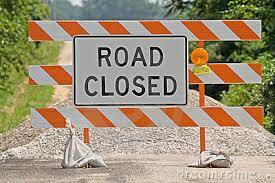 The orange and white construction fence with the sign “road closed” on it. It magically lays down, and allows that Batmobile access to and from Wayne Manor. That’s right, that rotary, “Ah…. hello; it’s the road to the Bat Cave…..Duh!” John, looked at me, smiled, and nodded in concurment. “Yes sir, Washington; we’re on to you! Crap. And I thought we could weed out the insincere forever…. As a native of western Washington State, I found your article quite amusing. Yes, it is the most beautiful place to be in the summer, but don’t tell anyone that! It’s crowded enough here already, and most of them are techie geeks with tons of money that are making it more and more expensive for everyone else here to live. But yes, I’m glad you had a chance to visit our beautiful state. People in California are forever talking about “microclimates.” It’s the first I’d heard of them, since moving here. I am beginning to tire of the word 🙂 Washington sounds just lovely. The Pacific Northwest has always been a great experience. Since I live in Bellingham, WA – there is not better place like it and my entire family enjoy it every season. Glad to be living in this part of this world. Trust me, your cousin did not lie, we are from Vancouvr Island, it usually pours in the winter. Cool blue blog. I can dig it. Wait, is that like an expression from the 60’s? Oh well, I’m from ancient times myself. You’re spot on with your descriptions, now stop telling ppl!! Unfortunately, with global weirding in full effect, it’s pushing things back. Our summers now from july-sept/oct and really good winter snow days late feb-april. If day the biggest difference is when it rains in Seattle, it’s usually light with very few locals using umbrellas. Other places in the nation, when it rains, it pours.